manufacturing mills left in the US. In the world of textile manufacturing there are company’s that will tout the Made in America moniker but an explanation of what that means may be helpful. A textile mill that is totally vertically integrated would raise the sheep for the wool or grow the cotton or flax for the fiber, then take that raw fiber and put it through their own carding process before it is spun and possibly dyed. That same mill would take spun yarn and weave and finish their own products. A company that would follow this entire process would be, in fact, vertically integrated. Brahms Mount runs with the yarn after receipt from the dye house and spinner. While not totally vertically integrated, we originate design as well as weave on our looms all products from the fiber spool forward in Maine and have done so since 1982. The woven rolls are then cut and sewn to product specifications then finished with designed edge treatments, inspected, washed, packaged and finally shipped. There are company’s that will source the woven fiber from Europe, Asia and else where, bring the finished fiber rolls to the states and then do cut and sew and finishing in their facility. 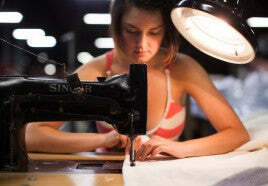 These companies’s are cut and sew practitioners or converters. Some companies are in the business of aggregating products, they buy completely finished products from abroad, bring them to the states and resell them in their own retail establishments or place their own private label on the products. Not to be picky, but it’s a point of pride with us at Brahms Mount, and important to understand what’s behind the ‘Made in America’ moniker! A six month search is over, thanks to a customer's suggestion! I found towels made in USA!